Satisfy your sweetest desires with the popular Candy Bars slot machine, a colorful and delightful game from IGT and available for free play here at Slotorama. Satisfy your sweetest desires with the popular Candy Bars slot machine, a colorful and delightful game from IGT and available for free play here at Slotorama. Some things in life are just that sweet and this game is certainly one of them. Featuring a unique 4-reel layout and 50-paylines, you’re in for a really sweet time spinning the reels today! The finger-snapping music is incredibly uplifting and just what you need to get the fun started. 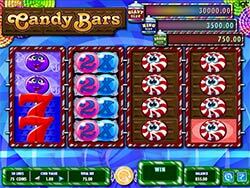 The slot background is decorated with colorful hard candies while on the reels you’ll find a variety of different symbols. Watch for red and blue sevens, purple candies, red and white candies, green gummies and chocolate. Wilds and Chocolate – When a purple, red and white, green gummy with chocolate backgrounds appear on reels 2, 3 and 4, they’ll substitute for the purple, red and white and green gummy symbols respectively. There is also a 2x symbol that appears on reels 2 and 3 which will substitute for all other symbols in a line win and pay 2x the win amount. If you can get 2 of the 2x symbols, you’ll win 4x the line win. Blackout Wins – Blackout Wins are what IGT are calling when you fill the entire board with the same symbol, which is completely possible in this game. Blackout wins are multiplied by the coin value and pay in addition to line wins. You can win anywhere from 5,000 to 25,000x your coin value! Snack Size, King Size and Giant Size Progressives! – Win progressive jackpots by filling entire reels with chocolate beginning with reel 2. Filling just reel 2 can win you the snack size jackpot. Filling reels 2 and 3 can get you the king size jackpot, and filling reels 2, 3 and 4 can earn you the Giant size jackpot prize!